On March 13 and 14, four planets meet in one of the most desirable astrological patterns around. A trine is the most favorable relationship between two planets. This 120-degree angle represents harmony, cooperation and an abundant flow of energy. These alignments are fairly common, but when a trio of planets form an equilateral triangle of three trines, it is a special event. 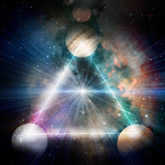 It's called a Grand Trine, and symbolizes opportunity and good fortune according to the nature of the bodies involved. On March 13 and 14 we'll experience one of these rare Grand Trines when magnetic Venus and lucky Jupiter join in sensual Taurus, then form trines with potent Pluto in Capricorn and skillful Mars in Virgo. This could be the perfect time to visualize material success and put a plan in effect to achieve it. Taurus, Capricorn and Virgo are practical Earth signs that are more concerned with productivity than promises. Their inherent awareness of material matters supplies a sense of reason that can lead to concrete results. Further power comes with this alignment because this quartet of planets is made of two very different yet complimentary pairs. Venus and Jupiter are called "benefics" in traditional Astrology, because they're both viewed in a very positive light. Venus is pleasure and love, while Jupiter signals hope, vision and good fortune. Their conjunction in Taurus might encourage us to indulge in life's pleasures. However, the risks of excessive consumption and spending are balanced by the common sense we find in the sign of the Bull. There's a great appreciation for value here that helps us find new resources and make the most of the ones we already have. Mars and Pluto are tough guys. They're not into seeking out the soft spots where we can lazily watch the world go by. Each one is about squeezing the most out of ourselves and our relationships. While harshness is often a part of their patterns, the harmonious trines from generous Jupiter and sweet Venus soften their rough edges. Yet Mars and Pluto make sure that we don't get lazy but take advantage of the opportunities available to us now. The separation between pleasure and productivity are reduced with this Grand Trine as we connect the capacities to act effectively and to receive graciously. Pluto is about eliminating non-essentials so that we can get to the core of the matter. Its trine to Mars adds punch and power by cutting out tasks, streamlining methods and focusing attention where it will do the most good. Pluto's trine to Venus mixes love with a profound sense of purpose that puts relationships on a more solid foundation. And its trine to philosophical Jupiter extracts the most applicable elements of our belief systems and allows us to set the less useful ones aside. Basically, this Grand Earth Trine is like finding a treasure chest of tools and materials with which to build the future. Business sense is sharp and a nose for finding what's needed points us in the right direction for success. A key to turning this opportunistic moment into a source of enduring rewards is the willingness to work hard where it counts most. Effort is essential, yet only when it's aimed where it's required. Intelligently choosing what we don't need to do will make a major difference. Rebuilding our economic lives and restoring health to our bodies and environment are among the gifts of this special week. Use them wisely to serve your interests and we will all benefit from your growth.